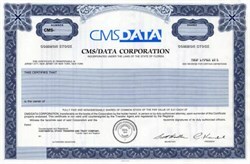 Beautifully engraved SPECIMEN certificate from the CMS/DATA Corporation. This historic document was printed by the Thomas De La Rue Bank Note Company and has an ornate border around it with a vignette of the company logo. This item has the printed signatures of the Company's President ( C. Kardil ) and Secretary ( Scott Kodler ). CMS/Data is based in Tallahassee, Florida and employs approximately 250 people worldwide in the development, sales and support of CMS OPEN, a client/server financial information management and time-based billing solution for professional services firms.